Friday, April 19th from 6 – 9pm, The Dolphin Marina and Restaurant will be featuring America’s Two Man Outlaw Country Band, North of Nashville, featuring Jay Basiner and Andrew Martelle, also of THIS WAY, an alt-country band from Maine nominated for ‘Best Folk, Country and Roots Act’ at the 2012 New England Music Awards. 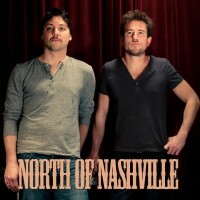 North of Nashville was recently named ‘2013 Band to Watch’ by Portland Press Herald. Visit www.dolphinmarinaandrestaurant.com for more info. Saturday, April 20th, The Gulf of Maine Lobster Foundation is holding its annual GEAR GRAB community shoreline cleanup in Harpswell (rain date on Sunday). Meet at Interstate Lobster or BIGS on Bailey Island at 8:00 AM for last minute instructions, donuts, coffee, and GEAR GRAB garb t-shirts. After cleanup, all volunteers are invited for a complimentary picnic lunch and prizes hosted by the Dolphin Restaurant at 12:30.